No READY. P1A15 error. Condenser charge timeout. I was asked to start own topic about my problem. Lic wrote: I didn't use car long time and I got died 12v battery. I charged battery, check it and found it in good condition. It is new battery, which I installed 3 months ago. So I putted battery back and I decided to connect only one wire (positive) and leave other one (negative) disconnected to prevent to discharge 12v battery again. I was not planning to use car for long time again. But little bit letter I decided to check if car will start, so I connected negative wire but didn't tight it well. I started car - it showed me ready and the over the car lights lit up on the dash. Next was probably my mistake - I decided to check if car runs well. I ride around neighborhood and I did couple good stops. I came back to parking, turned off car, turned it on again and I didn't get ready. I got the 12volt alert and the over the car lights lit up on the dash. I checked 12v battery again - it is fine, checked charging - no charging. I checked some fuses under hood - nothing. Lic wrote: So i connected tester and got errors p1a15 active and p1ae6 saved. Lic wrote: Canion sees battery fine, no problem with cells. It even showes me that car should show ready, but it does not. I checked errors again and first time i didn't see errors related to high voltage system. I sow only errors c1394, u1111, u1116 (i sow them last time too but i thought they are not so serios), but after sometime while i played with launch tester x431 it appeared again. This tester kind of poweful. I am able to test some car system. But i didn't find test to try to close main contactor. I looked cells - look like they are fine. Max disbalance is 0.01v, battery voltage is 350v. I don't know what i should look next. Lic wrote: i didn't have time to look car, so i decided to go to dealer to check car and may be to fix it. i towed car to dealer. first time they told me it is most likely computer died. second time they told me that they reprogrammed computer and car started working and they told me it happened because of not right 12v battery which i used. because it is new battery and because i checked this battery before (battery showed good current and good capacity) i told them i will not by battery from them and i understand risk to use my battery and i asked them to get car with my battery installed. when i came to get car they told me that they installed my battery and got same problem and they reprogrammed computer again to get car working with my battery. so i came, paid, moved car to dealer charger and left dealer because i didn't have another driver to go back on two cars. i came later with my wife. car was fully charged. i drove car back home about 30km and i didn't see any problems, but when i switched car of at home and switch it on - i got same problem and same errors. so i don't understand what is going on. most likely i will go to dealer and i will ask them what exactly they did to car. Lic wrote: so i looked car by launch tester and only serious error was P1A15. i erased it and car showed ready. I tried to switch it on and off several times - it was fine. i tried to make small ride and after switch off and on car showed same error again and doesn't show ready. i tried to find what is make car to show error and found that condenser charging timeout flag is on every time when car shows error P1A15. it is look like most likely car will show ready if i did car small rest before. same problem with same error when i tried to charge car. i tried to use other 12v battery from my other car and everything was the same - it is easy to get ready if i didn't use car some time and it starts to show error after even small ride. when car is show ready condenser voltage is 340v and real battery voltage is 350v. i did small video about how reacts voltages and contactors positions when i am trying to switch on car and it doesn't start. i will show it if somebody interesting. Here is video of fail switching on car. Lic wrote: So after long time I returned to repair car. All those time car was sitting on driveway. I tried to remove error and start car but after about 30 attempts I was not able to get ready. So in summer I left car in state in which car was starting successfully time to time, but right now it does not show ready at all. Same error, same problem - condenser can't charge in right time. It is strange why car doesn't show ready at all. Big difference is only temperature between summer and this time. I think I will try to open MCU and look condenser, but I am not sure what exactly to check. Any suggestions? PS I didn't use car from Jun 17. Before car had capacity around 36ah. Right now as I can see it has capacity in BMU settings only 29ah. I left car with around 67% SOC. For me it is strange that car lost so much capacity when it was just sitting on driveway. Lic wrote: I think I will try to open MCU and look condenser, but I am not sure what exactly to check. Any suggestions? Something causing extra load on the high voltage side, e.g. blown components in the MCU, or more likely given the history we've seen, the On Board Charrger. In particular, it might be those small capacitors in the OBC that blow so frequently. If the DC-DC and OBC 20 A fuse hasn't blown but those capacitors are shorted, then you won't be able to achieve ready. The auxiliary battery, especially since it's had ample time to discharge with all the little loads that cars have, and we know that a weak auxiliary battery can cause all sorts of problems. In particular, it might not be able to pull in three contactors, if it's really weak. The capacitor is the large black thing with "MEIDEN" written on it. Unless it's melted or otherwise visibly deformed, I doubt that you'll be able to determine much by looking at it, unfortunately. Only the auxiliary battery is easy to test/fix. Give it a charge with a 12 V charrger, since the DC-DC can't charge if from the traction battery without achieving ready (battery connected to HV circuits, such as DC-DC input). If it's older than say 3 years, replace it. If none of that helps, you'll need to try and measure the drain on the high voltage bus, without electroplating yourself. How confident are you with this sort of thing? I've heard of people activating contactors manually and measuring the resistance of the pre-charge resistor, but this is far from trivial if you're not set up for that sort of thing, and of course one end of the resistor you'd be measuring is connected to traction battery positive. Lic wrote: 12v is fine for sure. I have actually 3 around me. One of them 6 months old original mitsubishi i-miev battery. It is fully charged and checked for capacity and ability to provide good current without big voltage drop. I am fine to work with hi voltage battery. I have a lot of experience with repair and modifying my 116V electric scooter. I don't think there is a problem with extra load on hi voltage side. When dealer kind "repaired" car - I drove and charged car without any problems. Car showed regular 0.4A consumption from big battery on parking shift in ready mode. It was nothing unusual except it doesn't show ready after restart. So I think the same - I need some how check precharge resistor and main contactors. Is there information how manually switch on main contactors? Lic wrote: Is there information how manually switch on main contactors? Find the original of the below on http://mmc-manuals.ru/manuals/i-miev/on ... dex_M1.htm . 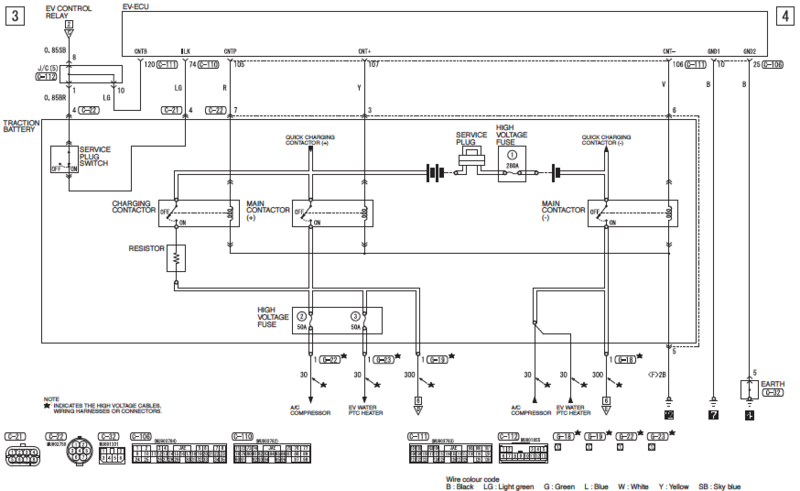 From the Troubleshooting and repair for On-board Charger (OBC), DC-DC Converter topic, first page. You will then have the pinouts for the connectors, just energise what you need with a 12 V supply or battery, with the service plugs disconnected. I have no idea how practical this is to do with a car on the ground. See also Imiev repair - precharge resistor (Australian Electric Vehicle Association forum). I don't think that the contactor coils are polarity sensitive (e.g. economiser present, or catch diode), but perhaps it's worth checking. kiev wrote: i think your contactors are damaged from back in April 2018 (see page 4) when you tried to start and then drove the car with a loose negative terminal on the Aux battery. The contactor coil was de-energized while under load (current was flowing thru the contact junction) and arcing occurred across the contact gap. Now the surface has been damaged and the resistance of the junction has been affected. So this is manifest as an intermittent fault due to arcing debris on the contacts: sometimes it will make a good contact and you get READY; sometimes it makes a poor contact and you get ~10V drop across the contacts, slow charging of the MCU condenser, car will not start and it throws the P1A15 DTC. This fault has progressively gotten worse. Back then you could sometimes get READY, now it is so bad that you will rarely get it to start. "One way to check would be put a voltmeter on the EV-ECU line that commands Main[+] and see if it goes to 12V when trying to start. EVECU is under the rear seat, yellow wire in connector 111, terminal 107, check voltage between here and ground/chassis." Also use a voltmeter to measure the open circuit voltage of the Aux battery, then measure it with the key turned to ON and START. Post the data, orr take a picture of the reading and post that. Check and replace the low-voltage supply relays that provide power for the EVECU and BMU. These may have been damaged by a loose negative terminal also, although if their supply is low then it should trigger a DTC. But the Main(+) contactor coil is driven by current from the EVECU thru the tiny supply relay. One other test: if the Main(+) is not coming on, then it seems that the car would not be able to charge; Does the car charge anymore? What DTCs are showing up on your scanner? Lic wrote: So procedure to connect battery to car is 1. Engage main (-) contactor and precharge contactor to charge condenser through precharge resistor. 2. checking if condenser get full battery voltage in exact time. 3. Engage main (+) contactor and provide battery energy to car. In my case car stops on step 2. So what is point to check main (+) contactor if my problem somewhere before engaging main (+) contactor? Am I missing something? Most likely I need to check main (-) contactor to see if it getting good 12v power. Re: No READY. P1A15 error. Condenser charge timeout. Lic wrote: I used diagnostic software and made video of what is going on after turning key to ready position. I left link for video here earlier. Ok, that would do it! Sorry, I somehow missed the video links earlier. It seemed to get to 338 V, which is only 12 V short of the battery voltage of 350 V, and is 97% of the way there. You won't get a lot better than that, it seems to me. But then it plummets to 70 V before the timeout and the main positive contactor never comes on. I note that the contactor status flags sometimes lag, e.g. there was over 200 V on the capacitor while the negative contactor was still listed as "off" (which is of course impossible). So perhaps the exact timing and sequence of events can't be totally trusted. But the fact that it did get to 338 V at one point, and was at 70 V on the next sample, suggests that something is draining the capacitor before the capacitor is declared charged. I wonder how they prevent the DC-DC from using any charge (apart from charging its own capacitors), and whether that delay (from initial power-on to actively drawing power) could be too short. You might be able to test this theory by temporarily removing the combined DC-DC and OBC 20 A fuse; at least it would isolate the problem to either the DC-DC or OBC, or something else (e.g. motor controller, flashover, air conditioner, heater, one of the battery contactors). BTW, what diagnostic software is that? (Pardon my ignorance there). I am using chinese launch x431. Today I opened small MCU window and checked what voltage is on pack wires when I try to switch on car. I used 2 voltmeters (good chinese and fluck). Both showed similar numbers something around 344-346v. (one time fluck showed 351v and chinese showed other time 349v). I used them separately. Unfortunately I was not able to find good analog voltmeter which should be better to check increasing voltage on main battery wires. Next I checked 12v battery. It showed 12.6v (connected to car), 12,4v when key turned half way and 12.25v when key turned full way and relays in pack started to clicks. Next I checked voltage on ev-ecu connector on contacts for main(-) contactor and precharge contactor. Main (-) showed 12.05v and it was easy to monitor it because main (-) starts first and disconnects last. Precharge showed 11.98v and it is look like it works only 1 second. Tomorrow I want to manually engage main(-) contactor and precharge contactor and see what stable voltage from battery I can see on main battery wires. if is not good idea please tell me. Lic wrote: Tomorrow I want to manually engage main(-) contactor and precharge contactor and see what stable voltage from battery I can see on main battery wires. if is not good idea please tell me. That sounds like a good thing, but be prepared to disconnect quickly, as it seems to me that something is putting a load on the battery before pre-charge is fully complete. But it would be good to know this for sure, being able to take a few seconds for a digital multimeter to settle. However, if there is a significant load on the battery, then the pre-charge resistor will be seriously overloaded. About 10 seconds of running the motor, wondering why it seems so slow this time, can lead to this. It took a week for the smell to go away. And of course, the pre-charge resistor is buried inside the battery pack, where it's not easy to get to. But a few seconds with really only the DC-DC, air conditioner, or heater as possible loads, hopefully won't hurt. You still don't know whether or not the EVECU has tried to command the main(+), but it may be so quick that a scope would be needed to see it. Precharge only takes about 0.125 sec (see scope trace in redcane's thread) and 97% is close enough to full such that the car should turn on the main; there is only 0.4 Amps flowing at that time. bad contacts, the EVECU is commanding main(+) and the car is trying to go to READY by turning on the MCU and DCDC, and they are the load that is pulling the buss voltage down. Or bad indicator, the EVECU is commanding main(+) but the indicator is not showing movement and the EVECU is shutting down. Or other component, the EVECU is not commanding main(+) due to some other issue. today I checked by scope signals from ev-ecu to main(+), main(-) and precharge contactors. I was able to see main(-) and precharge signals, but not main(+). Then I tried to manually engage main(+) contactor and I hear clamping noise from battery. Then I tried to manually engage main(-) and precharge contactors and see what voltage I can get on main battery wires. I saw stable 348v. I don't know what to check else. May be it is time to go to dealer again. The workshop manual says that the capacitor voltage is measured in the MCU and sent to the EVECU over the CAN buss. At one time you were having some CAN error DTCs--have those returned or is it all cleared? i would guess CAN is okay since you can read the condenser voltage using the phone app. In summary, after checking for good CAN buss, then the connectors, then the wires, then for intermittent faults, the FSM indicates to replace the MCU or the battery pack depending upon whether pack voltage is greater than 220 VDC. 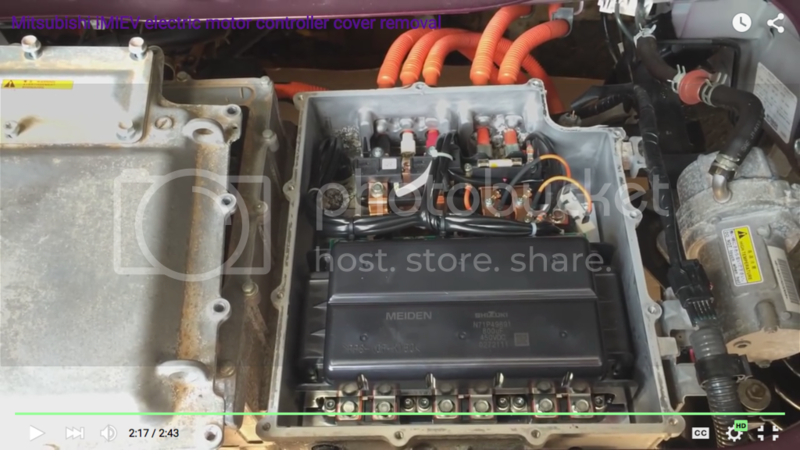 i would guess that the wiring is okay since you can read the voltage when you did the manual control of the precharge and (-) contactors, and the capacitors are okay since the voltage held steady, and the pack cells are okay by the voltage. One possibility not listed is the transistor device within the EVECU that switches 12V power to the main(+) coil, but it does seem that the EVECU may have internal diagnostics to set a DTC for such a failure mode, P0ADB. The only other test i can think of might be to remove all HV loads except the MCU; disconnect or remove the 20A fuse from the MCU to eliminate the OBC and DCDC, and disconnect the HV lines to the heater and Air Conditioner compressor. This would eliminate external loads that could be pulling down the HV during the time after precharge and before main(+). The Aux battery seems to be getting pulled low just for powering some relays at START. Maybe you could put a scope on it to catch the transient during START to see how far it is being pulled down. Many folks have had issues resolved by replacing a weak, old or worn out Aux battery. Here is a link for testing the Aux battery. They measure battery voltage after 15 seconds with a 130 Amp load. Dealer did procedure for P1A15 and told that problem should be in inverter which cost $8k new. There was a recall on some cars for the inverter (aka the EMCU, or MCU). i wonder if your issue is somehow related to the reason for the recall? It might be worth asking them for consideration. Description :	Due to none conformity during manufacture the resistance of the insulated base inside the motor control unit (MCU) which controls the electric motor, may decrease. As a result, the voltage in the circuit may become unstable causing the warning light to illuminate and the driving motor power to be restricted to the fail safe control. In the worst case scenario the vehicle may not be able to be restarted and the battery may not be able to be charged. Remedial Action :	Recall the vehicles that are likely to be affected and replace the engine MCU. Yes, I can ask. I don't think if it help, but I will try. Thank you for you help!